Everything you need to know about replacement and construction costs for multifamily projects using HUD 221(d)(4) financing. 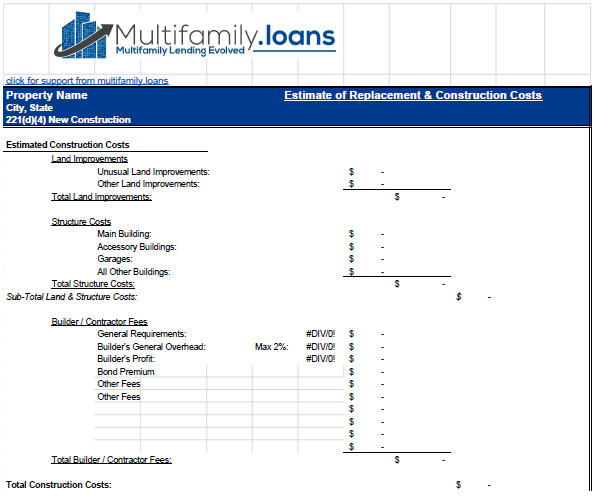 Before beginning the HUD multifamily construction loan process, it's important to know how much your project will cost to build (construction cost), and how much it will take to replace (replacement cost). An estimated replacement cost can be calculated by examining factors including the warranted price of the fully improved land, the as-is property value (for rehabs), and off-site factors (if needed, for rehabs).